"Creating a new series for Marvel comics: The Micronauts by Bill Mantlo"
It all began on Christmas morn, 1977, at the Long Island home of my parents… My son had just reduced a mountain of X-Mas presents to disposable rubble and sat, in the midst of this mess of paper, tearing a group of tiny shiny figurines out of their vacuum sealed packages. The figures seemed to catch the sparkle of the lights from my parents' Christmas tree. They were unlike any toys I had ever seen-and I've run the gamut in my time, from Dodge City to G.I. Joe to the Shogun Warriors. I asked Adam (that's my son's name) if I could see them before they went the way of all plastic and, when he handed them to me, I held in my palm the four basic figures of a new concept in toys called…The Micronauts. Time Traveler. Acroyear. Galactic Warrior. Space Glider. I knew nothing about these toys except their names on the package, but already I was beginning to extrapolate origins for them. Even from the start-and, I admit, their being called the Micronauts by Mego, the manufacturer, didn't hurt-I envisioned them as small, microscopic even, inhabiting an other-verse apart from, but in conjunctive with ours. Space Glider seemed to suggest a Reed Richards nobility, an aspect of command, of dignity. Acroyear, faceless, his armor gleaming, a fantastic sword clenched in his coldly metallic hand, seemed to hearken back to a warrior Mr. Spock. For some reason Galactic Warrior seemed insect-like-I can almost hear clicks and whistles and strange scraping interjected into his speech. But Time Traveler…there was a mystery there, glimmerings of cosmic vastness, intimations of knowledge and space and time all having been broken down and reassembled to produce something entirely new…unexplainable… different. The following week I walked into Jim shooters office (Jim's first act on becoming Editor was to ask for new ideas and concepts) and told him, briefly, about the toys my son had received for Christmas. Jim got in touch with Mego and, a month later, we had preliminary photographs of the entire Micronauts line. I was, to say the least, floored. I had already begun extrapolating, based on just the four original figurines, a whole series of concepts. Now here, in front of me, were literally hundreds of additional figures, thousands of new suggested concepts…in effect, a whole world in need of a rationale for being. I began to plan in earnest. Mego had given each and every figure and bit of hardware a name, but little or no conceptual background. The names did suggest concepts, but were, in some cases, unwieldy. I decided that then and there that the names, nine times out of ten, would serve merely as titles. But who, or what then, were the Micronauts? They would be, I decided, inhabitants of a "world within worlds" as their name suggested. Homeworld, a whirling molecule on a spiraling DNA chain, became the first world in the Microverse that I blessed with life. It was a once Earth-like world now dominated by a madman and an idea…the idea of immortality. Bearing a gift of eternal life, Baron Karza - Chief Scientist and overseer of the Body Banks-offered, for the price of submission, reconstruction of damaged organs and limbs…immortality, if not in one's original guise. The Homeworldians acquiesced and, death eradicated for the well-to-do, began to develop their world, razing all the green areas, covering all the seas, until Homeworld resembled nothing so much a s a huge, all encompassing housing project…with the Body Banks as it's center. BIOTRON-the roboid that shared Commander Rann's consciousness during their thousand-year sojourn in space. And, complementing Biotron is… MICROTRON-a personal roboid, jester, tutor, and servant to… MARIONETTE-Princess Mari, last remaining member of the Royal Family of Homeworld, hating Baron Karza and committed to the rescue of her brother from Karza's Body Banks and the restoration of her world. United by the Time Traveler, for motives none of them can guess, the Mirconauts recapture Commander Rann's ship and flee the Microverse…to Earth.There, the presence of the Microverse causes ripples of concern throughout the military-industrial complex…and a promise of cosmic diversity to us normal folk. A few postscripts should be added here: While the Micronauts will shuttle back and forth, the main action of the book will take place amidst the immensity of the Microverse.In tone it will be more Space Fantasy than Science Fiction-a genre I've wanted to work in since "The Sword in the Star" in Marvel Preview. Mego's concepts will serve merely as springboards for Mike Golden's and my creativity. Oh, didn't I mention Mike? 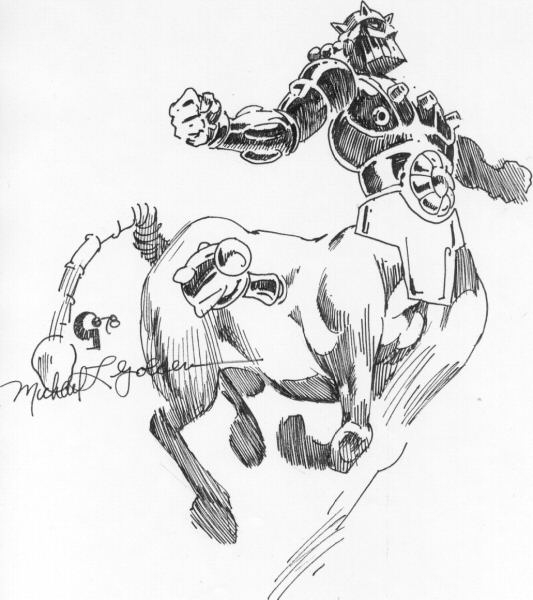 Mike Golden, whose Mister Miracle and "The Demon" at DC introduced one of the most excited new artists of the 70s, will be drawing and co-plotting the book. Joe Rubinstein, whose embellishment of the last year's Avengers Annual made that issues a landmark in comics history, will be inking the book and will also be co-plotting, thus brining the oft-ignored inker into the primary creative phase of the mag. Bob Hall, whose preliminary (done before Mike's assignment to the book and thus subject to change) drawings grace this essay, will be editing and offering his own ideas and sense of excitement to the finished work. And that's about it - a new book in under 5000 words. We're not immodest enough to predict great things for the Micronauts yet but, in my time at Marvel rarely have I seen a creative team so excited about a new project or working so synchronously to focus their creative egos to make it happen. Whether we succeed or not will have to be judged by you, the people out there when the Micronauts goes on sale sometime this summer or fall. We believe there's a tremendous capacity for excitement still to be found in comics, and it is my personal feeling that most books fail not because of reader disinterest, but because of lack of conceptualization in the creation of a new book. Too many times-and Marvel has been as guilty of this as anyone-a new book is whipped together and thrown at the fans as if they should be glad we're throwing them a collector's edition. I'm sorry, but too many new titles these past few years weren't worth buying, let alone collecting-and too many good ideas never got a chance because skewed commercial analyses convinced publishers that only "super hero" books sell. Howard the Duck, Kiss, The Human Fly, Star Hunters, John Carter, and Conan seem to have taught some people nothing. The Micronauts is different, exciting, conceptual, and intriguing. It's also gonna be one helluva lot of fun! And that's really the entire point of my creativity.